Forget about all the scams you that you heard during UPA’s regime. Coal, 2G and Commonwealth scams were undoubtedly bad for the exchequer but can you bucket them under national treason? No. Ishrat’s case would go down in the history of India as an out right case of treason committed by the Congress Party to bring down one political opponent called Narendra Damodardas Modi. All norms were broken and all hell was let loose just to witch-hunt one single person. The entire political spectrum used MSM to go after Modi and ended up compromising national security. This was achieved by pitting one security agency against the other and destroying many lives and careers in the process. It would not be an exaggeration to say that Congress did not shy away from cutting a deal with ISI to bring down its political opponent. 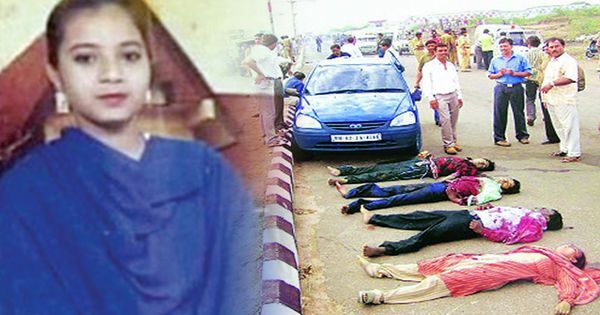 Encounters are not uncommon in India, why was this one case of Ishrat Jahan given so much importance? Who will pay for this treason? And the most important question- will Modi drop the façade of Mahatama Gandhi to finally charge the Congress for sedition and bring the case to its logical conclusion? It is not about political witch-hunt but about setting the standards for future and what India as a nation can tolerate. While Gujaral only dismantled the Indian deep assets in Pakistan, the Congress party under Sonia Gandhi took it to a completely new level by offering an open playground to ISI and compromising national security. The role of other parties in this case is not so clean either. We all need to question what forced Nitish Kumar to portray Ishrat as Bihar’s daughter or Brinda Karat to inaugurate an ambulance service in the name of a known terrorist. All attempts were made to silence the critics who tried to showcase the true story behind Ishrat. The video attached below is one of the very few attempts at investigative journalism to bring forward this story. While journalists like Rana Ayyub were given free access to the power corridors of New Delhi, some journalists had to shell out money from their own pockets to uncover this truth. Watch the below video to understand the Ishrat case as explained by the current NSA Ajit Doval and other intelligence experts in detail. It would be a great dishonour to the martyrdom of brave Indian soldiers if such sabotage of national interests is allowed for petty political gains. The nation needs to stand together and ask questions from Congress and other political parties as well as demand a judicial inquiry so that these anti-nationals are brought to book and punished for their treason. No action will only push India one more step towards being a banana republic, where foreign powers are free to meddle into local politics and extract geo-political benefits. Please read the below storified account of tweets to understand more nuances of this case and how the producers of above video had to fight against the whole Congress ecosystem to register their voice and bring out the truth. Is US ripe for people’s revolution?